Often, we think of grains and oilseeds prices as being at the mercy of the weather and the agricultural sector's specific set of economic forces that include: planting, growing-and-harvest cycles and crop inventories. Indeed, these risk factors are important determinants of crop prices. But in addition to them, macroeconomic factors play a subtle role in agriculture. The increasingly negative correlation between crop prices and the U.S. dollar reflects structural changes in global agricultural production and trade that have increased the influence of macroeconomic factors. 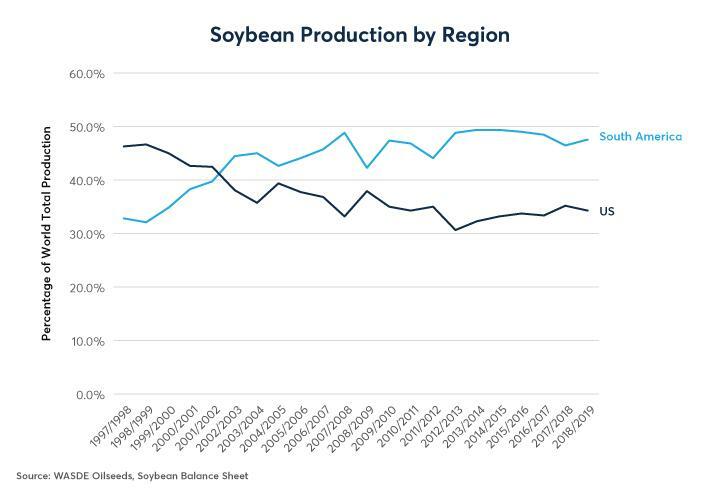 Often, we think of grains and oilseeds prices as being at the mercy of the weather and the agricultural sector's specific set of economic forces that include: planting, growing-and-harvest cycles and crop inventories. Indeed, these risk factors are important determinants of crop prices. But in addition to them, macroeconomic factors play a subtle role in agriculture. For example, during the great inflation of the 1970s, crop prices soared as the U.S. dollar (USD) plunged. Crop prices retreated during the 1980s as tight Federal Reserve monetary policy brought disinflation, and the USD rebounded. Even so, the strength or weakness of the U.S. dollar showed basically zero correlation (between -0.1 and +0.1) with day-to-day movements in crop prices between 1975 and the early 2000s, when the correlation both strengthened and became more negative (Figure 1). Figure 1: Dollar Strength or Weakness Mattered Little Until Around 2001. 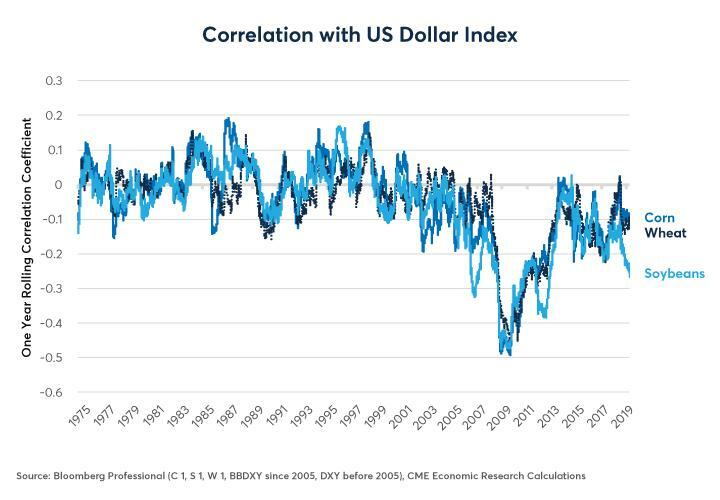 The increasingly negative correlation between crop prices and the U.S. dollar reflects structural changes in global agricultural production and trade that have increased the influence of macroeconomic factors. 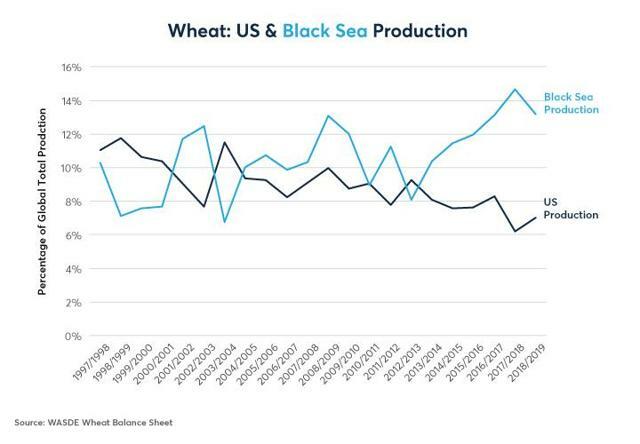 As production of corn and wheat in the Black Sea region has soared, what happens in Russia and Ukraine is now of paramount importance, especially for wheat. Likewise, corn and soy production has increased dramatically in Argentina and Brazil, making what happens to South American currencies central to determining the prices of those two crops. 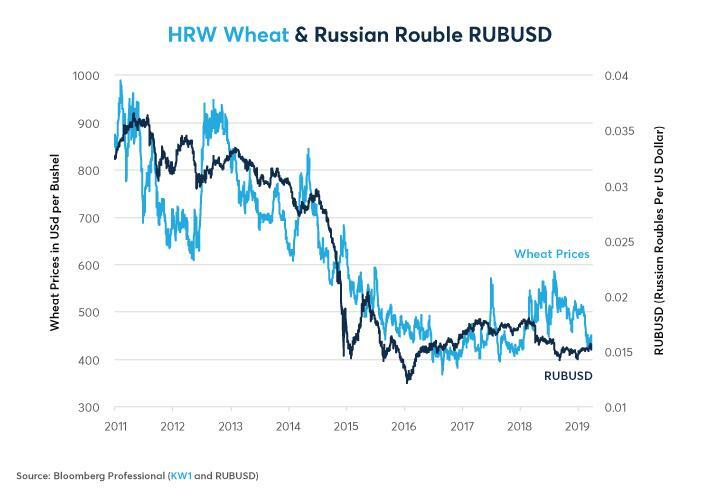 The fate of the Russian ruble (RUB) and the Brazilian real (BRL) are closely linked to the outcomes in key agricultural markets. At the same time, a greater diversity of crop growing regions might be mitigating the effects of weather events. Inclement crop weather in the US, South America or the Black Sea could still send crop prices higher, but such weather is less likely to occur in all three places at once. The Brazilian and Russian economies are, in turn, heavily influenced by developments in the world's most rapidly growing major economy: China. While China's 1.3 billion consumers are the most important food market in the world, variations in China's growth rate have little direct influence on the prices of agricultural goods. If China grows at, say 6% rather than 7 or 8%, Chinese consumers probably won't buy much less of corn, soy and wheat. But their demand will grow more slowly for oil and industrial metals like iron ore and copper. Energy and metals are key exports from many major agriculture-exporting nations including Australia, Brazil, Canada and Russia. China's demand for raw materials moves the values of their currency via the markets for energy and metals. This, in turn, changes the relative costs of production for farmers in South America, the Black Sea region and elsewhere versus U.S. farmers, who transact entirely in USD. Over the past three decades, U.S. wheat production has fallen from 8-12% of the world total to between 6-8%. Meanwhile, Black Sea wheat production has risen from 8-12% of global production to around 13-15% (Figure 2). The post-Soviet revolution in Black Sea agricultural productivity has transformed the region to the world's leading wheat exporter, selling the equivalent of 7-8% of global production to the rest of the world each year. Meanwhile, U.S. exports of wheat used to be 4-5% of global production, and now are around 3% of world output (Figure 3). Figure 2: The Black Sea Region Has Replaced The US As The Top Wheat Exporter. 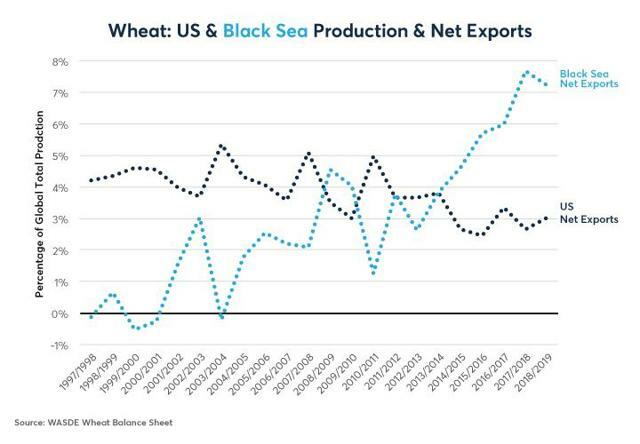 Figure 3: Black Sea Wheat Exports Dwarf US Exports. Will Sino-U.S. Trade War Impact Grain, Meat Markets? 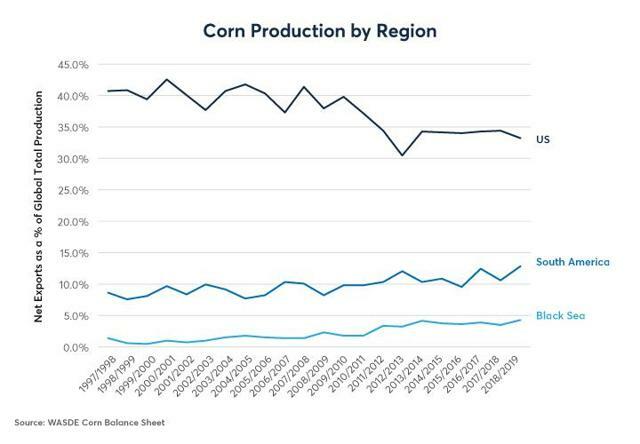 The US remains the dominant corn producer, but U.S. production has declined as a percentage of the world total. Until 2010, U.S. corn production ranged from 38-42% of the world total but has since fallen to around 33-34%. Over the same period, South American production rose from 7-10% of world total to around 11-13% while Black Sea corn production increased from 1-3% of the world total to just below 5% (Figure 4). 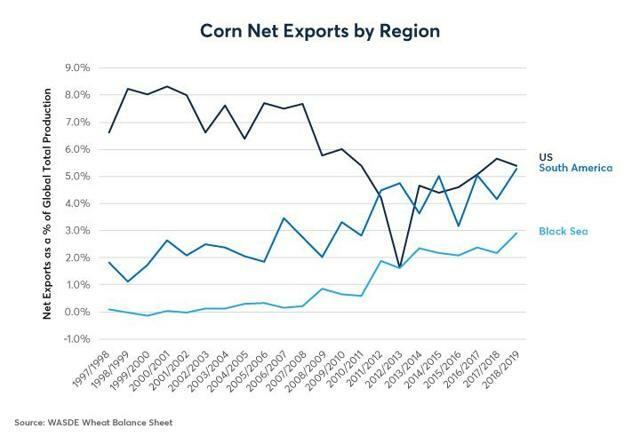 The impact on net exports of corn is much more dramatic. Since the US consumes most of its production, it exports only the equivalent of 5.5% of total global production, down from 8% during the late 1990s and early 2000s. Meanwhile, South American net exports have risen from just 1-3% of global production to about 5.5% of world output - just about the same as the US. In the past decade, Black Sea net exports of corn have increased from nothing to around 3% of world total output (Figure 5). Figure 4: US Remains Dominant In Corn But Its Production Has Fallen As % Of Global Total. Figure 5: South America Has Caught Up To The US In Corn Exports And The Black Sea Isn't Far Behind. In the soybean market, South America has increased its total production from 32% to 48% of world total while U.S. production has fallen from 47% of global total to just below 33% since the late 1990s (Figure 6). U.S. net exports of soybeans stagnated at around 15% of global production while South American exports now account for around 23% of world output, up from around 6-7% 20 years ago (Figure 7). Figure 6: Brazil And Argentina Are Now The Dominant Soybean Producers. 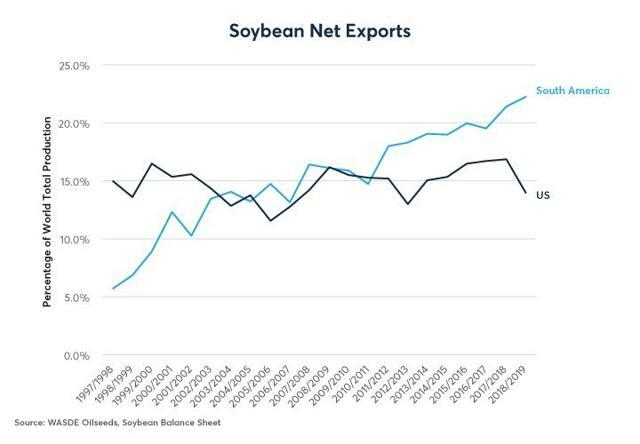 Figure 7: US Soybean Exports Have Stagnated While South America's Have Quadrupled. Little wonder then that soybean and corn prices closely track the BRLUSD exchange rate (Figure 8 and 9) and that wheat prices move roughly in tandem with the RUBUSD rate (Figure 10). U.S. farmers have always been at the mercy of the USD to some extent but increasingly their prosperity is at the mercy of events in faraway places. 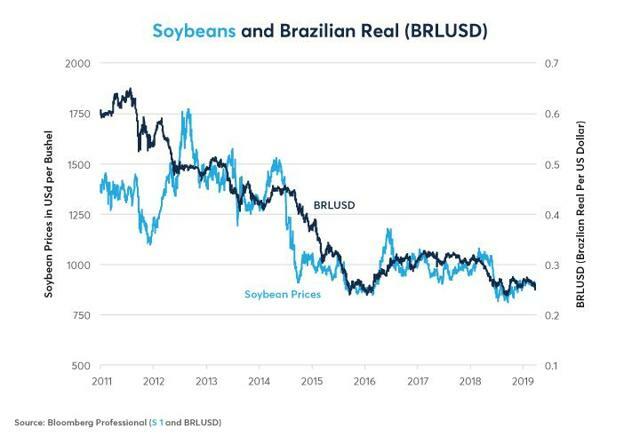 Brazil's fiscal deficits and difficulties in passing pension reform could weaken BRL and hurt U.S. growers of corn and especially soybeans. Meanwhile, Russia's exemplary fiscal health might turn out to be good news for U.S. farmers of wheat - and maybe corn as well. Figure 8: The Fate Of The Brazilian Real Exerts A Strong Influence On Soybean Prices. 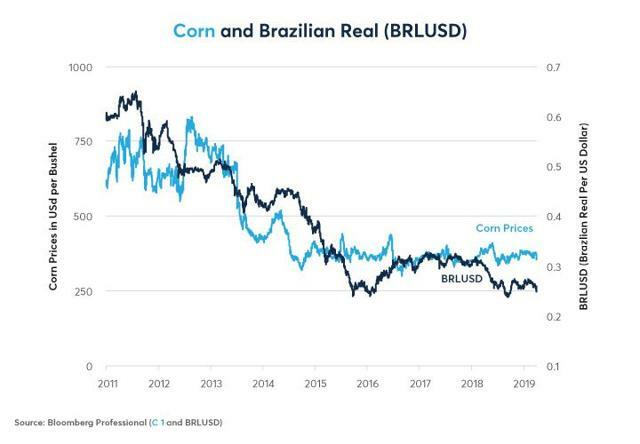 Figure 9: Corn Prices Track The Brazilian Real. Figure 10: Wheat Exhibits A Strong Co-Movement With The Russian Ruble. Both Brazil and Russia, however, are at the mercy of China. When measuring China's growth rate, one could certainly look to the country's official GDP, which is a very broad measure that includes China's increasingly diversified services economy. A narrower measure, called the Li Keqiang Index, which measures rail freight volumes, electricity consumption and bank loans, correlates exceptionally well with corn, soy and wheat prices as well as with the prices of other commodities such as copper and oil. Moreover, it also has strong correlations with the currencies of major agricultural exporters such as BRL, RUB but also the Australian and Canadian dollars (Figure 11). Figure 11: Chinese Growth Influences Metals And Energy Prices, Emerging Market FX And Crop Prices. The US-China trade war has been bad news for American farmers, depressing the price of soybeans, in particular, as China curtailed its imports of U.S. supplies. That said, the trade war has spurred China to dramatically ease monetary policy by reducing its reserve requirement ratio. China has also recently enacted additional tax cuts. 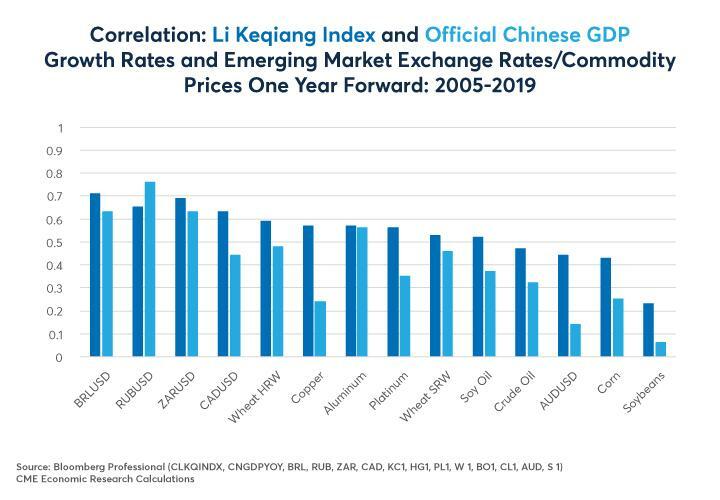 The easing of China's monetary policy has steepened the country's yield curve and, over the past dozen years, China's yield curve has been an excellent predictor of accelerations and decelerations in both the Li Keqiang growth index as well as China's official GDP. As such, if China's growth does indeed respond to the monetary and fiscal stimulus, this could boost not only China's economic growth but also energy and metals prices, and through them the currencies of key agricultural exporting nations. This could raise production costs in Brazil, Russia and other emerging agriculture exporters and offer some relief to American farmers. What is clear is that farmers around the world are the mercy of more than just weather and the U.S. dollar. They are increasingly impacted by public policy decision made in far off places like Brasilia, Moscow and Beijing. Global crop growing areas are increasingly diversified. Increased supply diversification reduces the impact of weather. Crop prices are increasingly sensitive to U.S. dollar, Brazilian real, Russian ruble. Currency movements change relative production costs. China influences ag markets both directly (buying decisions) and indirectly via its buying of energy, metals and emerging market currencies. Russia's robust fiscal health might be good news for wheat. Brazil's fiscal problems could weigh on soybeans. China's stimulus could boost crop prices via energy, metals and emerging market currency effects but only if it overcomes other problems (demographics, debt and trade disputes).